Google Chrome Frame does not Let me Sign in my Gmail Account? 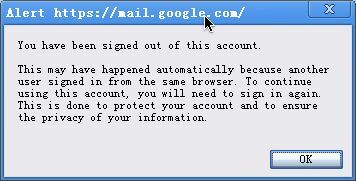 I do not know what’s wrong with my Google Chrome Frame, when I tried to sign in one of my Gmail account(another account does has this problem), I always got the alert as the following screen shot. and when I click OK, I got sign out. You have been signed out this account. This may have happened automatically because another user signed in from the same browser. To continue using this accout, you will need to sign in again. This is done to protect your account and to ensure the privacy of your information. I am sure I have signed out another account and try this account again and again, but without any success.